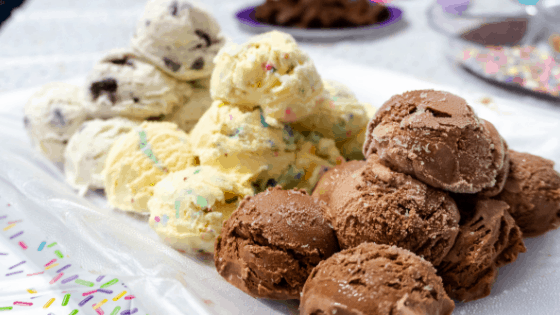 These Ice Cream Party Ideas save time and hassle when putting your party together. Check out my tips and tricks to having a successful Ice Cream Social for your child’s birthday party! When my daughter approached me this year and asked for an Ice Cream party instead of our traditional cake or cupcakes theme, I have to be honest, it really threw me off! I had a mini panic attack because I had already started planning cupcake flavors and fun decorations for her sleepover! I even tried to convince her that her friends would enjoy cupcakes more so than ice cream but I inevitably gave in and started planning an ice cream party that the kids would enjoy. Save Your Time, Save Your Sanity! When I envisioned the party I saw children having a rough time scooping ice cream and making a huge mess. I remembered a handy trick that I had seen many years ago but had never tried! I pre-scooped the ice cream ahead of time, placed it on a tray, and wrapped it tight with cling wrap. That way, when the party was in full swing and it was time to dig in, the kids could just grab scoops of ice cream and enjoy. It saved so much time and effort! I used an ice cream scoop that had been dipped in cold water to make the ice cream glide more smoothly when scooping. It was a success! I baked brownies a day before the party and once they were cool, I cut them into cubes and wrapped them in cling wrap as well. I visited my local bulk store and grabbed different candies to add to a serving tray to give the kids more options for their toppings and I also bought two types of cookies and crushed them before adding them to the tray. Using cling wrap kept everything fresh and easy to serve when it came to starting the party. I wanted to add some color to her spread and I came across these really cute Ice Cream Cups with matching spoons! After the party, I gave the kids their cups to take home and they were all really excited! I made these sandwiches by allowing vanilla ice cream to warm up slightly before adding to Ice Cream Sandwich wafers. After placing the top wafer on the ice cream, I rolled the sandwich edges around in sprinkles and put them back in the freezer until the party. They tasted just like the classic ice cream sandwich with a fun twist! I filled goodie bags with items such as fun erasers, bracelets, and other items found in the dollar section in stores. I also grabbed these super cute Ice Cream Pens for their bags. They work really well and the kids really loved them! Come Monday, they were all brought their pen to school to show off! Last year, my daughter had a Cupcake themed party for her birthday and the kids really loved to play the cupcake themed BINGO sheets I made. This year, I made BINGO sheets for an Ice Cream and Sleepover party and the kids had so much fun! We found dollar items at various dollar stores including fuzzy pens, stress balls, fuzzy and colorful socks, stuffed animals, and little journals and notebooks that I knew they would enjoy. My husband and I placed all the items in a large gift bag and whoever won BINGO had to pick from the bag without looking. They requested to play the game so much that each child ended up winning 4 prizes. It was a great way to have fun and it’s also helped fill time! GET YOUR FREE ICE CREAM BINGO PRINTABLE HERE!